Don't Drive By Poverty. Get Involved. Invitation to Super Wealthy, too. Last week WBEZ published a report showing the shrinking middle class and growing divide between rich and poor in Chicago. I wrote about it here. 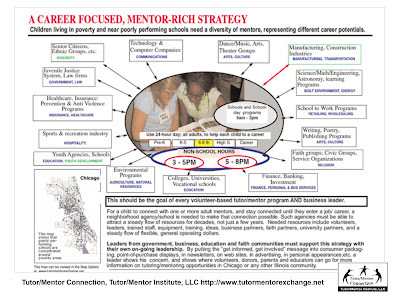 A few days later I created a graphic with a set of maps, by WBEZ, and by the Tutor/Mentor Connection (T/MC), which I created in 1993 and still lead today. WBEZ consistently produces some of the best maps to focus attention on poverty and inequality in Chicago. I put two in this graphic. On the far left is a map showing low digital access (see in this article). In the middle is one showing the growing gap between rich and poor and the shrinking middle class. 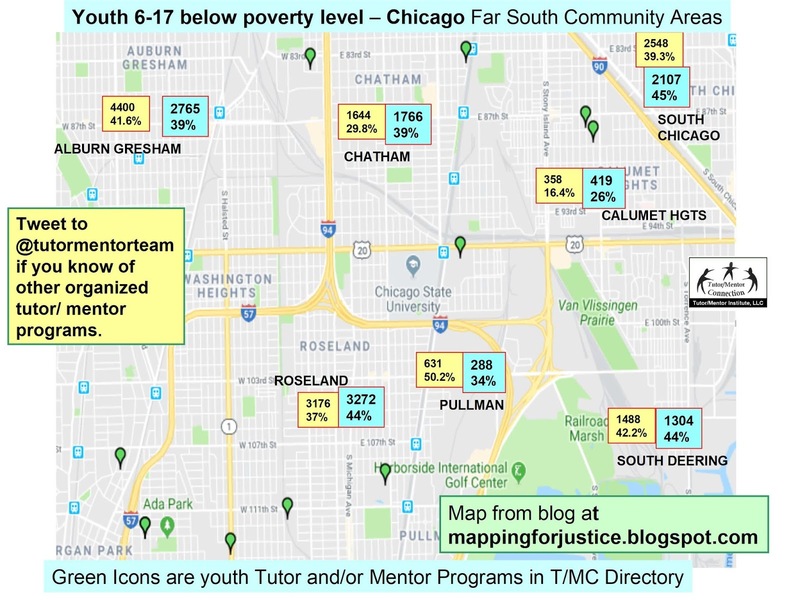 On the right is a Tutor/Mentor Connection map from the late 2000s, showing poverty areas, known non-school tutor/mentor programs, and transportation routes bringing people to and from the city for work or socialization every day (see T/MC map in this article). 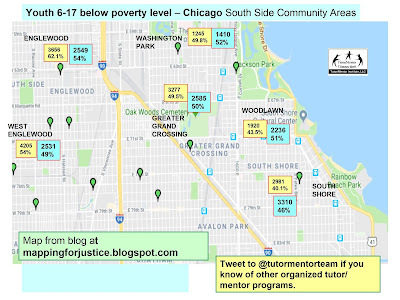 Chicago is a huge city, thus drawing people from affluent areas into poverty neighborhoods to be part of organized volunteer-based tutor/mentor programs becomes more difficult, as the distances grow. Yet the rich transportation system in Chicago provides access routes that many could use to reach places in neighborhoods where they might connect with kids during the after work (5pm to 8pm hours). About a week ago I started seeing Tweets from The Bridgespan Group about a report titled "Four Pathways to Greater Giving", which focused on the philanthropy of the ultra-wealthy. For the ultra-wealthy, spending down 50% of wealth in 20 years requires an annual payout rate of more than 11%. Yet on average, America’s wealthiest donate just 1.2% of their assets to charity each year. Learn more. I am reading the report now, and highlighting key passages, using Hypothes.is. You're welcome to join me. Imagine if super wealthy donors adopted high poverty sections of Chicago and its suburbs, with long-term involvement and investment. That's been my vision for many years. I used the graphic below in a 2014 article, and again last year, when two billionaires were asking for political donations to support their campaign for Governor of Illinois. If you use the "drive by poverty" map, you see expressways running through each of the poverty zones of Chicago. While these are physical transportation routes, they can also be virtual guides, to places on the Internet where volunteers, donors, youth development program staff and leaders, researchers and others can talk about the needs of youth and families and the way well-organized, volunteer-based tutor/mentor programs expand social capital and support systems and offer a path out of poverty, while also engaging more people in discussions of the other related problems that also need to be addressed. In the Bridgespan Group report, one challenge raised was finding trusted intermediaries who could channel large donations to a network of smaller organizations. 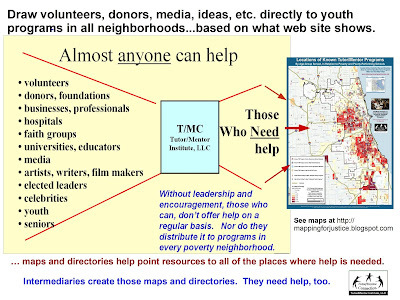 In the graphic below, I show the role of a Tutor/Mentor Connection, connecting people who could help, including wealthy people, with places where kids and families need help, and organized youth development, tutor and mentor programs in those places. 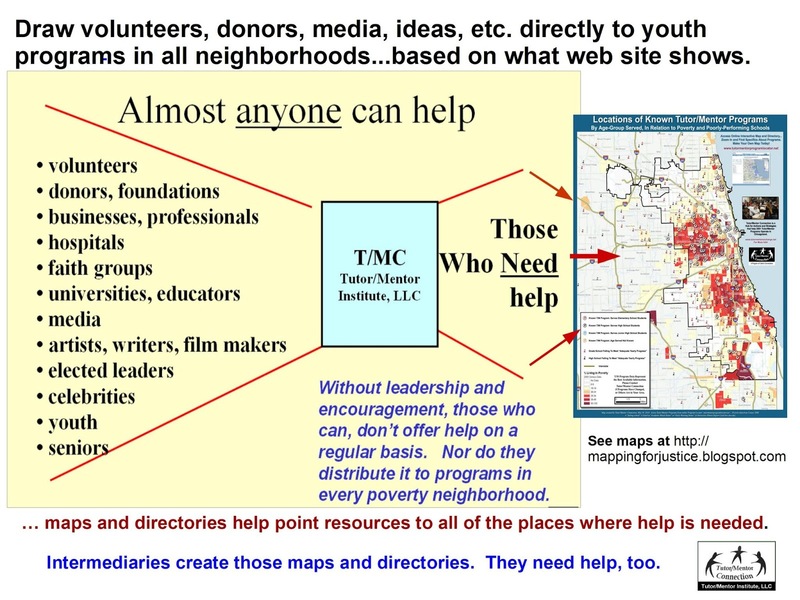 While I point to a map of Chicago on this graphic, that map could be any major city in the world, and the intermediary could be an organization coached by myself to apply Tutor/Mentor Connection strategies, using tools that I've been trying to develop with limited and inconsistent resources for more than two decades. The beauty of the Internet is that anyone can spend as much, or as little, time as they want digging into the information that's available. 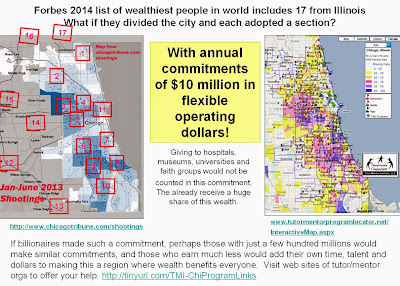 Thus, I invite those who can help to browse through my past articles, read PDF reports like this, showing what I've been trying to build, then as you build your understanding, begin to think of ways you might help me re-build the T/MC for Chicago, but make it a useful tool for any city. Or, spend time in this planning Wiki, to see what I've been trying to do, what needs help and rebuilding, and what opportunities still need to be developed. It's the Oscars this weekend, so read this article, which I wrote about a "do over" following the 2017 Oscars, when the wrong movie was announced as "Best Picture". Think of ways an ultra wealthy family might adopt, and own, this re-build, as their own long term commitment to closing the wealth and opportunity gaps in America and the world. I've written several more "do over" articles since then, which you can find here. In the short term, a contribution in the five figures or less might have a great impact on helping me continue to bring attention to these ideas. Visit this page if you're interested. 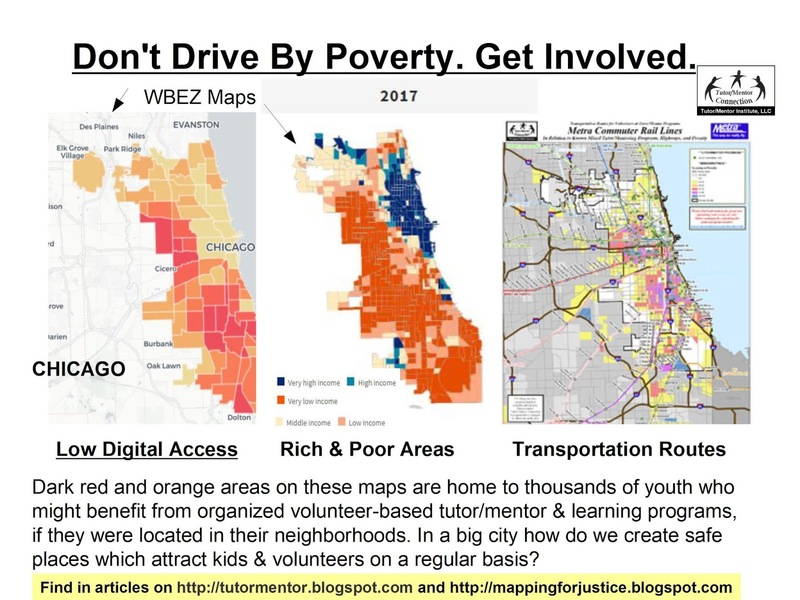 I've spent the past 35 years connecting volunteers from middle class and more affluent parts of Chicago with kids living in high poverty areas, via organized tutor/mentor programs. The goal was to create some of the learning experiences and opportunities and social networks available to some that are not available to others. I've used maps to show where programs are located, where they are most needed, and to help volunteers, donors and parents find existing programs, or help new once grow. However, the map of Chicago has changed dramatically over the past 40 years, making this goal much more difficult. Below is are two maps from a WBEZ article titled "The Middle Class is Shrinking Everywhere. In Chicago, It's Almost Gone." Follow the links in the WBEZ article to a) article by Voorhees Center for Neighborhood and Community Improvement at UIC, which is the original source of the maps used in the WBEZ article; and b) Pew Research article titled America’s Shrinking Middle Class: A Close Look at Changes Within Metropolitan Areas, which focuses on metropolitan areas throughout the entire USA. You can see a dramatic change in Chicago demographics, creating two Chicagos, one rich, and one poor, with few in the middle. I've been trying to bridge these divides by helping youth tutor/mentor programs grow in different parts of Chicago. It's been difficult. 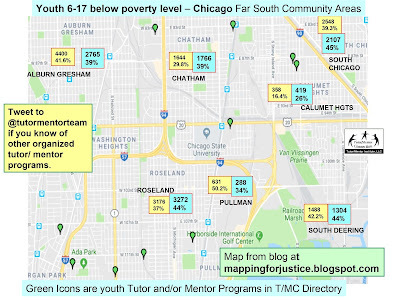 At the left is my map showing non-school tutor and/or mentor programs in Chicago. I circled areas of very high income, showing that there are many youth programs in this area, or on the fringes. You can view this map on the MappingforJustice blog, along with many other articles showing uses of maps. The article also includes a link to my list of Chicago area tutor/mentor programs. If you look at some of my Tweets @tutormentorteam, and articles I've posted in the past few weeks, you can see how I work to keep this list updated, and how I try to draw attention to programs. You'll also see a concern that some programs are very well organized with a lot of information on their web sites, while others have less formal organization and less information on the web site. Below is a graphic I've used for 20 years to visualize the design of a mentor-rich youth program, with volunteers from different work and college backgrounds sharing their experiences and opening doors to career opportunities for kids who don't have many people living near them who model these experiences. Note that on this graphic the arrows from the hub to the spokes on the wheel go both ways. That's because volunteers who enter these programs can learn much about poverty and inequality and share what they learn with people in their workplace, family and faith networks. That's always been the goal because unless more people are getting personally involved in providing opportunities for urban youth, little will change. 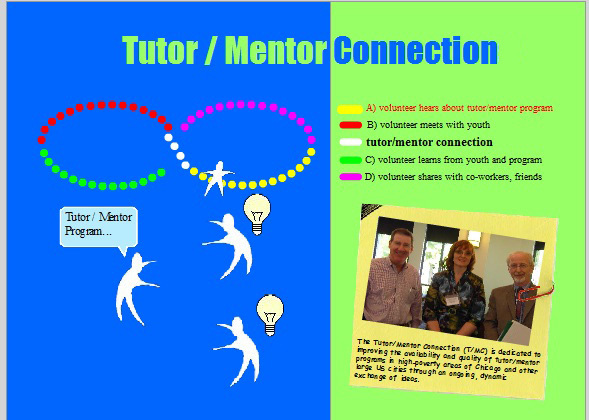 At the right is a graphic from a "service learning LOOP" animation created by interns between 2007 and 2010, to show how volunteers who get involved in a tutor/mentor program begin to share what they are learning with others. See it in this article. Another version can be seen here. 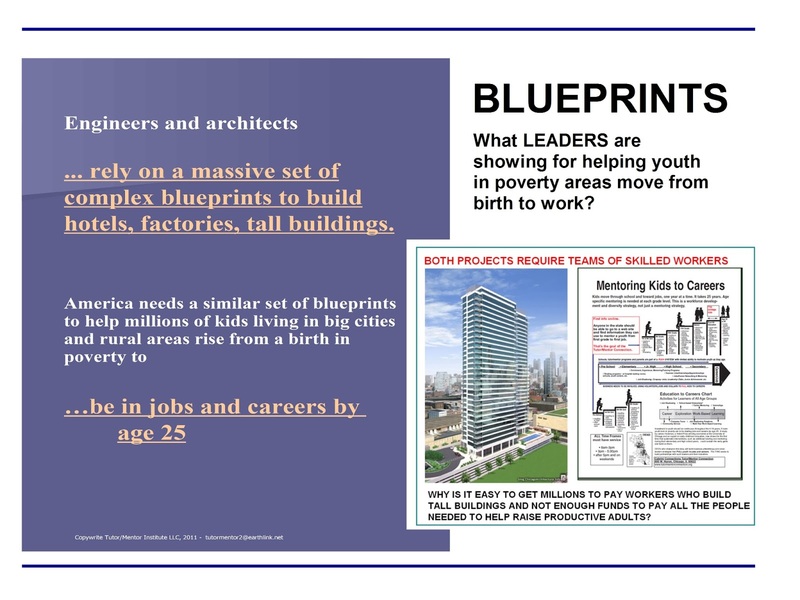 With the changing demographics, concentrating high income people along the Northeast lakefront of Chicago, and dramatically reducing the middle class, how will we create places for youth and volunteers to connect in the types of organized, on-going, programs that build trust, relationships, empathy and understanding? eMentoring programs are emerging as a way to make connections between volunteers who don't live in poverty areas and with youth who do. I point to a few in this section of the Tutor/Mentor library. I'm not yet confident in the ability of these programs to build the depth of relationship that is possible from meeting face to face two to three times every month. One reason I'm concerned is shown by another WBEZ map, which shows the Digital Divide in Chicago. If kids don't have a place to access the internet, how can they form regular relationships with eMentors? Maybe using phones? I've collected some Digital Divide articles on this site. Unless more people become motivated to dig into these articles, or read my blog, those articles will be seen by too few people. Too few will be involved in building solutions to these problems. One of my frustrations is that I've not been able to maintain the interactive tutor/mentor program locator which the Tutor/Mentor Connection built between 2004 and 2008. At the right is a screen shot from the current version. I show poverty levels, just like the WBEZ maps, with overlays that show locations of tutor/mentor programs, and other overlays that show indicators of need, such as poorly performing schools, and assets, such as businesses, faith groups, hospitals and universities, located in different parts of the city. Unfortunately this has not been updated since 2010 so the demographics are from 2000 and other data is out of date. I keep looking for partners who would help update this and/or rebuild it, then use it in efforts to build connections between rich and poor in cities like Chicago. Want to help? Connect with me on Twitter, Facebook and/or LinkedIN, and share my articles with others. That's one way. Start a conversation about other ways to help. That's another way. Another is to send a small contribution to help me keep writing these stories and maintaining the web library. What Tutor and/or Mentor Programs Operate in Chicago Region? 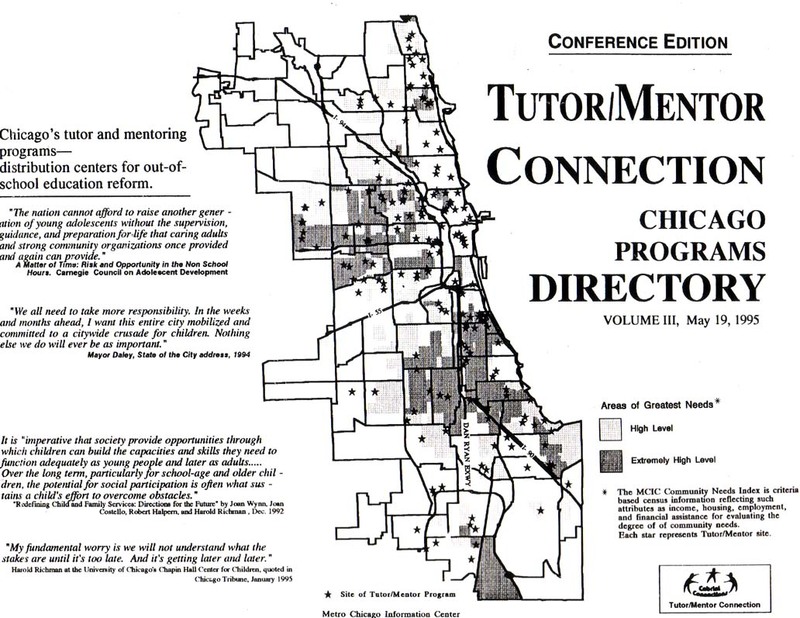 I led volunteer-based tutor/mentor programs in Chicago from 1975 to 2011, where youth and volunteers met weekly from September through May at a central location, and many returned from year to year over several years. The montage above shows a few of the youth and volunteers from one of these programs. 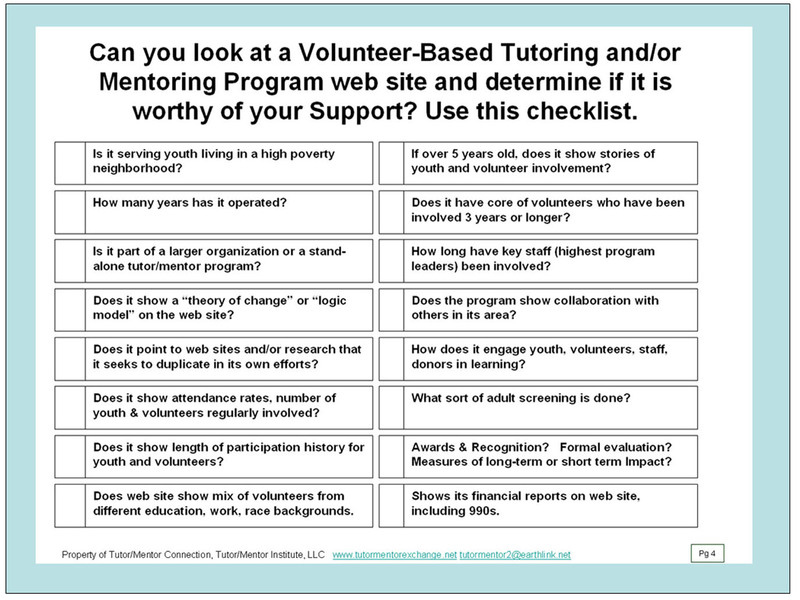 I created the Tutor/Mentor Connection in 1993 to build a master data-base of existing programs in an effort to help each program get ideas and resources that would enable them to build long-term connections to youth. I published this in a printed directory each year from 1994-2002, and have hosted it on a web directory since 1998. I'm still doing that. One of the challenges, is keeping information up-to-date. At various times since 1993 I've had paid staff to help me do this, and funds to create an internet portal to share the information. Since 2011 I've not had any help. I'm in the process of updating the list of programs. If you browse my @tutormentorteam posts on Twitter for the past two weeks, you can see how I'm Tweeting out web site addresses of programs I'm looking at. I'm also writing about this on my blog. I've been doing that since 2005. Here's an article I posted last Friday, talking about the need for more programs in the North part of Chicago. Yesterday I went through this list of programs on the far South side of Chicago. I created two maps, shown below, based on the programs in my list. Visit this article to see the map that I used to create these views. This shows area South and West of Hyde Park, down to 83rd Street. Click on either map to view an enlarged version. The yellow (2011 data) and blue (2017 data) numbers show high poverty youth, age 6-17, in each community area. Thus, you can see that there are more than 2000 kids in many areas who could benefit from well-organized, volunteer-based tutor/mentor programs. The green icons are programs I know about, listed here, and here, in my web library. Just by looking at the map you can see that there are too few programs. The problem is, I'm not fully confident about my information. When I look at some of these web sites, I find that information has not been updated in two or more years. Or, I don't see much detail showing a theory of change, a program design, a history, or on-going strategy. Or, there may be programs operating that I don't know about, which are not in my directory. One reason that I host this library is that volunteers, parents, media, and/or donors ought to be able to use it to find programs in different parts of the Chicago region, learn what they do, and have enough information to decide if they want to get involved with them. The other is to help programs learn from each other. Programs should be spending time looking at what other programs in Chicago and other cities do, and borrowing ideas to help them keep improving their own program. Volunteers and donors should be doing the same thing, for the same purpose. Every program, in every neighborhood, needs to be world class, or great, at what they do to help kids. Many have a long way to go to achieve this goal. Below is a checklist, that I included in this Shoppers Guide pdf. Ideally you'd find some, or all, of t his information when you look at a youth program web site. Few programs actually include most of this. Thus, I'm trying to influence donors and volunteers to ask for this information, while also encouraging programs to look for ways to collect this data and show it on their sites. One way to do this is to post information on Twitter, showing how some programs share information on their web sites. This is Chicago Youth Programs, Inc. I don't single out individual programs doing better than others because great programs are needed in every high poverty area and because there are many different opinions on what "great" looks like. Here's what I do say: If you want to help kids, choose what area you want to help, then look at the map, or the directory, and determine what programs operate in that area. Then look at the web site to see what they show. If there's enough information, you can easily decide how you want to help. However, if there's not enough information, you might need to call the program, do a site visit, and get more information. They way you help, might be to update the web site so it shows more of what the program is doing. Or you might provide a donation so they can hire someone to do this work. In most places, more programs are needed to reach more k-12 kids. This means, that if you want to help a specific area, your role might be to build a planning team that duplicates what I've been doing, and helps programs grow where needed. As we enter 2019, I am doing this work without any help. Thus, my first goal is that groups in different parts of the Chicago region volunteer to take on the role of updating my database or programs. People living closer can gather better information than I can. They can discover information about programs that's not on the web site. They can also tell me if programs are no longer operating and should be removed from the site. If if they do great work, but don't host an organized, strategy based, tutor/mentor program. In that case, they below in a different directory. And they can help draw attention to the programs they are learning about, using Tweets, Instagram, Faceook, blogs, video, local media, etc. This is work that could be done by teams of youth/volunteers from schools, colleges, faith groups, businesses and even existing tutor/mentor programs. Without better information, and more people looking at it, we don't have a way to help build the type of mentor-rich support system kids in many high poverty areas need to move safely and successfully through school and into adult lives. I'm on Twitter @tutormentorteam. Find me on Facebook or LinkedIN. Let's connect and talk about ways to help more kids have access to organized, on-going, tutor, mentor and learning opportunities. If you want to contribute money to help me do this work, visit this page. I've been updating links in a list of Chicago non-school tutor and/or mentoring programs that I've hosted since 1993, in an on-going effort to help great programs reach more k-12 kids in high poverty areas. I organize my list by sections of the city, so just finished looking at programs in the far North part of the city, near Lake Michigan. Below is a map I've created, using data provided by the Hearthland Alliance, to show the number of kids, age 6-17, who are below poverty, living in this area. The blue box shows data from 2017 and the yellow box shows same data from 2011. Thus you can see if the numbers went up, or down. In this case, there is a dramatic increase in the number of low income kids in West Rogers Park while the number in Rogers Park, near the lake, has stayed about the same, at 2106. What concerns me is how few organized tutor/mentor programs I can find in the area. Click this link and view my list. It actually covers a wider range of area than just the far North, but each of the green icons on the map I'm showing is included. Are there more? Between 1993 and now there were tutoring programs at several churches in the area. Over the past few years I've deleted many of these from my list since there is no information on the church web site indicating they still offer an organized, on-going, tutor/mentor program. I have been seeking help (and contributions) to update my list of tutor/mentor programs, add new programs, delete those that no longer exists, then give attention to them on an on-going basis. Below is a Tweet I sent out this week to highlight the Inspired Youth Tutoring Program. Others can do this. Perhaps there is a youth group at one of the churches in the area, or at a local high school, who would take on the Tutor/Mentor Connection as an on-going project. Perhaps someone like the new #InVESTinChi anti violence program would help with finding partners, and funding. Over the weekend I'll start looking at other sections of the Chicago Programs List. I already updated links for programs in the central part of the city. If you want to help I'm on Twitter @tutormentorteam and on Facebook and LinkedIN. You can also introduce yourself with a comment below. If you want to make a contribution visit this page. 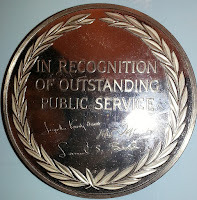 Jefferson Award for Public Service - New Name. Same Goal. 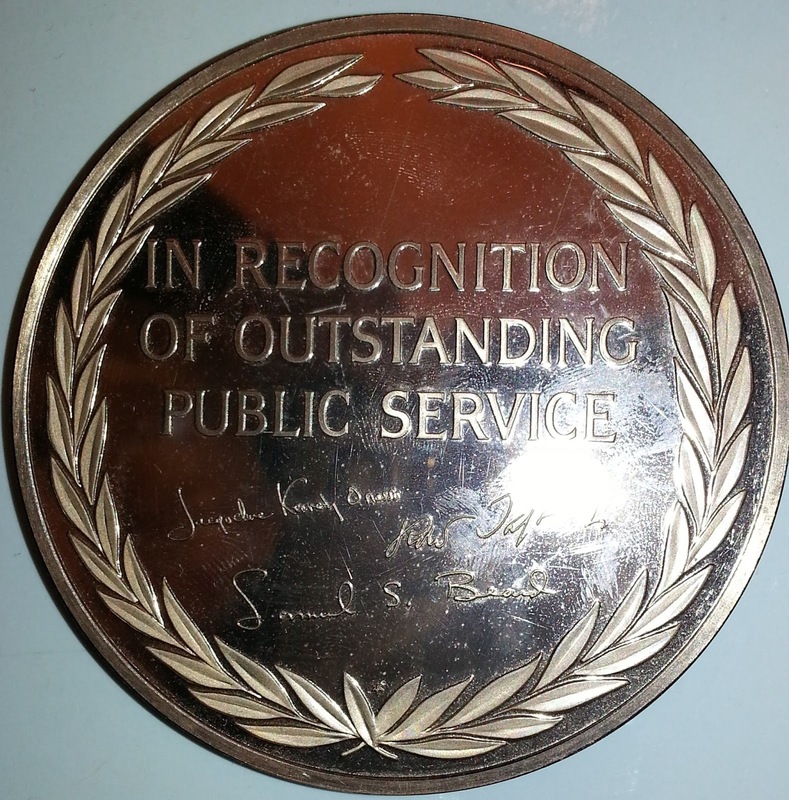 Among many honors that I've received over the past 40 years was the SunTimes Jefferson Award for Public Service, which I received in 1982. I wrote about this a couple of times in the past. Here's one article, with a link to the original Chicago SunTimes article. I was leading the volunteer-based tutor/mentor program at Montgomery Ward at that time, and still holding a full-time retail advertising management role with the Montgomery Ward Corporation. Much has changed in the many years since then, but I'm still trying to support tutor/mentor programs and kids in poverty, by trying to influence others to get involved, and in how they use their time and talent. I received an email today saying that the foundation that makes this award is changing their name to MultiplyingGood. They included this short video with the newsletter. I hope you'll look at it. I don't come from a high profile or wealthy family, and never have risen to high levels of personal fame, so having the Montgomery Ward Corporation as a program sponsor for my efforts up till they went out of business in 2000, was really valuable in opening doors. Things have been a bit more difficult since then. My Jefferson Award was presented to me by Governor Jim Thompson of Illinois. That's us in the photo at the right. 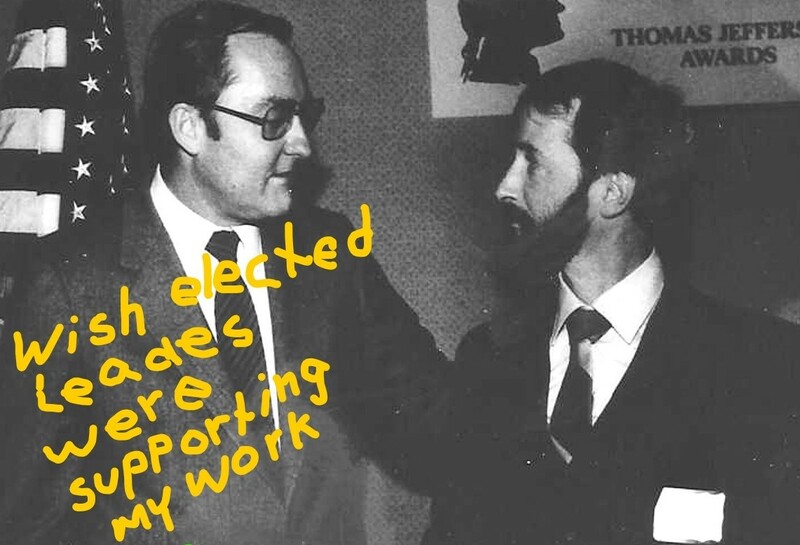 I've added an annotation to the photo, which sums up the frustrations I've had for the past 40 years. While I've rubbed elbows with rich and famous people few have made an effort to consistently share news about the work I've been doing, so others would get involved. I think the MultiplyingGood organization is attempting to do that. As the Jefferson Awards for Public Service they maintained a blog, and in 2014 wrote an article about me. I hope that as they change names, this archive of recognition will remain in place, or will be moved to a new web address. Otherwise, I'll need to take some tips from my #clmooc friends who have been talking about content curation and web archives, and find a link to this on the "WaybackMachine" which is where I go to search for links to web sites that no longer are available. 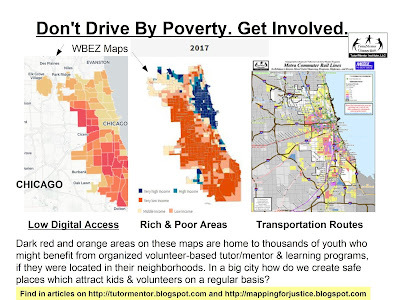 On Saturday I wrote about my annual effort to update links to Chicago non-school tutor and/or mentor programs in my web library. I've been Tweeting to draw attention to programs as I do this. Big Brothers Big Sisters of Metro Chicago. @BBBSChi I point to the map on their site that shows site-based locations. I also pointed to a presentation I created to show things I'd like to see on every tutor/mentor program web site. Few include most of this. Thus, donors will need to encourage it, and provide funds for the work of collecting data and updating sites. I started building a list of Chicago youth tutor and/or mentor programs in 1993 and published this in a printed directory every year from 1994 to 2002. It never was sent to more than 500 people, so its reach was limited. We never had much advertising money so create events to generate news stories and draw attention to the list. We put the list of programs on-line in 1998 and in a searchable directory in 2004, which enabled more people to find the information. However, I've not had funds to update that since 2011. Thus, the list of programs on the Tutor/Mentor Connection site is the most updated list, with nearly 200 programs included. To keep this current I need to open every link to make sure it's working, at least once ever spring. I'm doing that now. As I do this, I've been using my WindowsSnippingTool to pull an image from each program's web site, which I've then been sharing on Twitter. I've posted a few Tweets below. If you visit my @tutormentorteam page on Twitter, you can scroll through Tweets I've posted and see these, and more. Below is a Tweet where I point to the list of programs on my web site, and shows the number of "hits" each site has received. This shows that I'm helping connect potential volunteers, donors, youth, etc. with these programs. That's been my goal since starting the Tutor/Mentor Connection in 1993. I need help doing this. 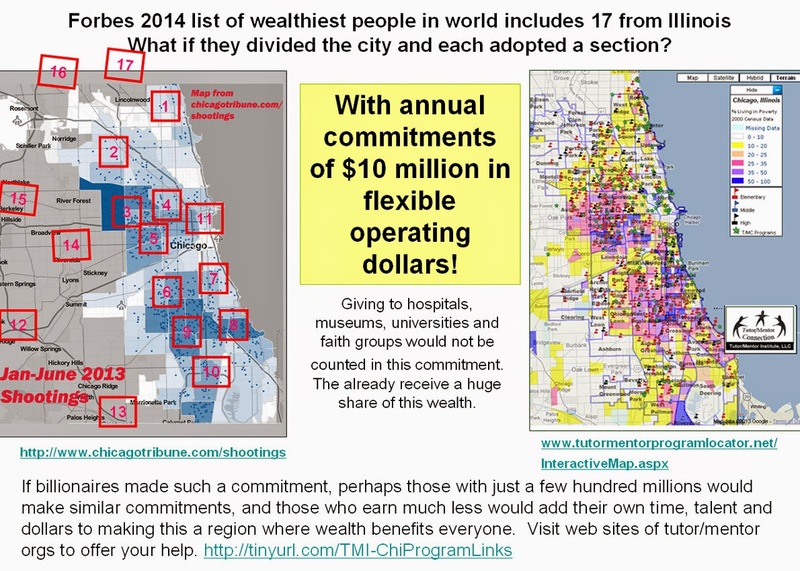 Take a look at the graphic below, which I posted in this article, talking about billionaires adopting Chicago neighborhoods. I don't have a sponsor/benefactor, or source of revenue to do what I've been doing. I keep reading about wealthy people making major gifts to universities, in many cases without a specific goal. Thus, my first wish is that one of these people adopt the Tutor/Mentor Institute, LLC, and Tutor/Mentor Connection, and a) provide a major gift to help re-build it's programs and technology; and/or b) provide a major gift to a university to bring the Tutor/Mentor Institute (and Dan Bassill) into a university as a program that engages students, faculty, alumni and community. You can use this map a second way. I'm looking for teams of volunteers (could be a student group at an area high school), who will adopt sections of the city and suburbs, and help update my programs directory. That team would do exactly what I do. Open the links to make sure they work. Find new links to replace broken links. Let me know of programs no longer active, or new ones now in the neighborhood. Then share information about programs you're looking at, using Twitter, Facebook, Instagram, etc. If you're not in Chicago, think of creating a Tutor/Mentor Connection type structure to do what I've been doing to help fill high poverty areas with needed youth tutor, mentor and learning organizations. Invite me to help you. If you want to take that role reach out to me on Twitter, Facebook, or LinkedIN. Finally, you can make a small contribution to help me cover monthly expenses, which now average about $700. Visit this page and use PayPal to send a contribution, or to mail a contribution. Thanks to Tutoring Chicago for sharing this video on LinkedIN. And thanks to School on Wheels - Indianapolis for creating it. If you're a volunteer tutor, tutor/mentor or staff in a program, this short video is a useful resource. 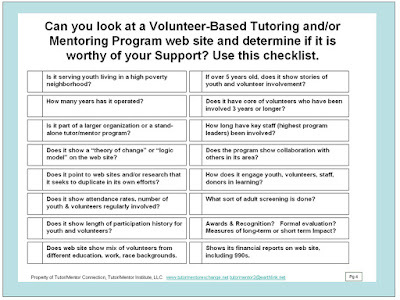 I added this to the 'training links" section on the Tutor/Mentor Connection web site. In this article I'm sharing some of what I've been seeing on Twitter and Facebook from Chicago based youth Tutor and/or Mentor programs. You can look at this the same way I do, by following this list of programs on Twitter. 50 of our Tutoring students are without tutors/mentors! Help them finish the school year strong by joining our family of volunteers—and change a child’s life! I'm seeing more than this in every 24 hour cycle, but only selected a few from the top of my feed for this post. I encourage others to do exactly what I've done. View the list, then write a story pointing to posts from some of the different tutor/mentor programs in Chicago, or in a different city, if yoiu don't live here. 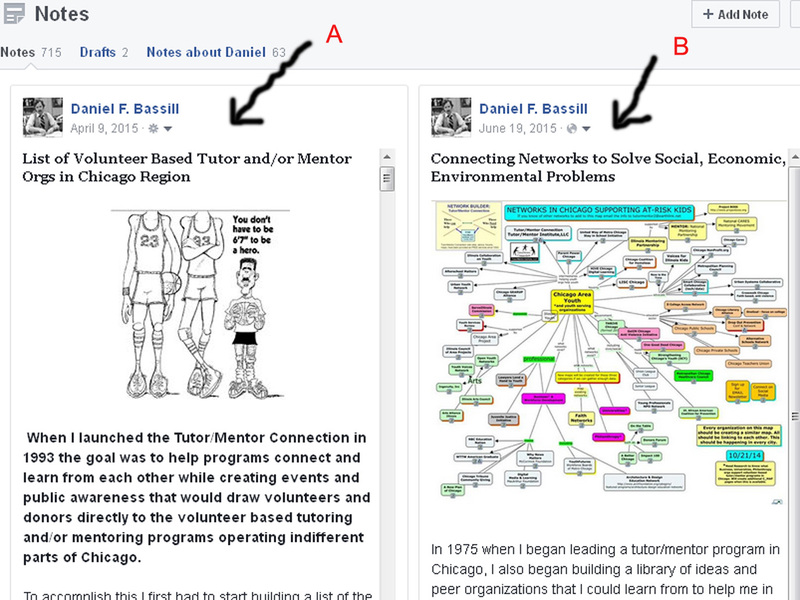 Facebook also has posts by Chicago tutor/mentor programs, but it is really difficult to find them. What I mean by that is on Twitter, you can open my list, and scroll the feed, and see what's been posted in the past day or week. If programs are sharing what they do, you'll see it. The Facebook news feed does not have a list/sort feature like Twitter has. On your news feed you get everything from all of the friends and pages you like. Thus, seeing what youth tutor/mentor programs in Chicago are doing is really difficult. 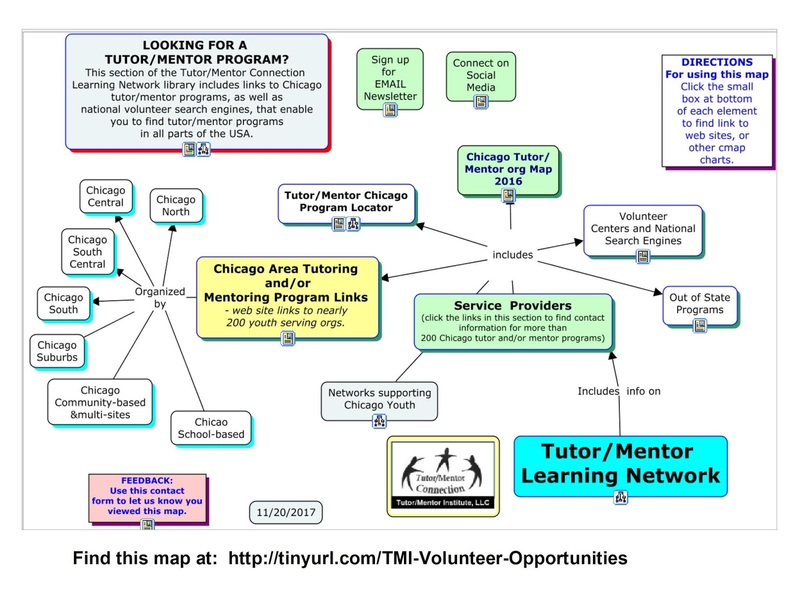 This graphic is in the NOTES section of my Facebook page, and includes a list of Chicago youth tutor/mentor programs. You can scroll the list, and click on a page, to see what that program is sharing. But you don't get a list showing what all of these programs are sharing. LinkedIN works the same way. Thus, unless you are looking at Facebook or LinkedIN for hours every day, you won't see much of what's posted by Chicago tutor/mentor programs. In a few minutes on Twitter, you can see what's been posted over the past 24 hours. Volunteers, donors and media can't find you and tell your story if you're not helping them. 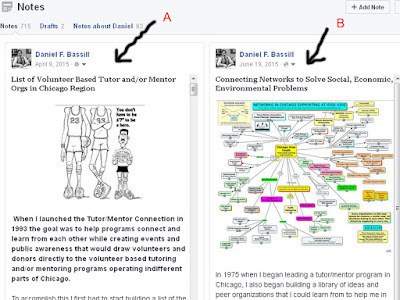 Note: If someone is using Facebook or LinkedIN and has found a way to view lists of Chicago tutor/mentor programs, please post a comment with instructions for doing this.